Hello friends! in·spire (verb): to affect, guide or arouse by divine influence; to fill with enlivening or exalting emotion. with artists who are talented, passionate, creative and -- inspirational. 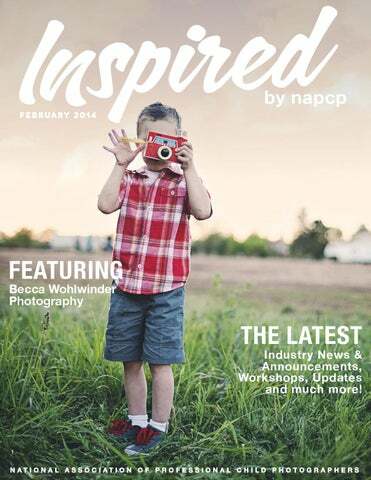 It is for this reason that we have decided to dub our monthly newsletter “INSPIRED.” Of course, we’ll continue to bring you monthly spotlights on our members who share insight on how they run their business, how they balance family life with their passion for photography, how they maintain meaningful involvement in their community… and how they produce such stunning work! and family photographer who has vowed to never grow up. A few things to know about Becca: she loves working with children, she’s obsessed with all things Harry Potter and The Walking Dead and she can’t get enough of Dr. Pepper. She’s not afraid to get dirty with children during her sessions – she’s been known to crawl in the dirt and have stick sword fights! We admire her for her passion, her drive and her imagination. She’s been recognized lately as the winner of many of our Image Competitions, and her work has been published in Props for Portrait Photography by Tracy Dorr. diving into the scoring process over the next few months – results will be announced in early April. Thanks to everyone who participated! with your loved ones. Live, laugh and love. The February 2014 NAPCP International Image Competition closed yesterday at midnight and we could not be more excited to peak through your submissions. The purpose of NAPCPâ&#x20AC;&#x2122;s Image Competitions is to recognize the accomplishments and creative excellence of our members, rewarding their talent with medallions, priority listing on our directory, vendor endorsements, member points, titles and professional recognition. amily photographer based out of Clovis, New Mexico. Becca has been photographing children and familys since 2008 and has developed a stunning and unique look and style all her own. We were so pleased to be able to spotlight her this month as our February feature! for portfolio building sessions, that way your pricing is out there and there is no sticker shock when you raise your prices when your ready to do this for real. keep at it and dont give up! If you really want to do this you can but it will be hard work! And the other photographers out there are not your enemy or your competition if you go about things the correct way they can end up being your bestest friends! Im lucky enough to be great friends with a lot of local photographers and we all happily refer clients to each other when were booked up or its a inquiry for something we dont photograph! Consider them colleagues rather than competition! Join local photography groups and just shoot all you can! crazy with them for a bit. then get them ready for bed! 8-10ish reply to email and facebook messages, chill out with my oldest and watch Csi or the walking dead or something! 10:30ish BED! Where do you see your life 5 years from now? This summer my husband is retiring from the military so we will be moving (again) once we know where we are going and once my daughter is in school is when im really going to knuckle down and do this for real! I want land! I want land as my studio within the next 5 years. With different areas for different seasons/sessions. I will have a christmas trees, wildflowers, barns, ponds, a green house all the locations you dream about but on my own property and I cant wait! To see more of Becca's work, please visit her site here!